If you want to enjoy your holiday in peace and quiet - then Frydenstrand Camping is the place to live! Our toilet and bathroom facilities are fine with large rooms and underfloor heating. Enjoy a nice family bathroom, separate handicap room with bath and toilet. Washing machines and tumble dryers. In the camping kitchen there is a microwave and mini oven. For tent campers there is a fridge and possibility of cooking equipment and service. The playground has all children's wishes - bouncy castle, climbing tower, sandbox, etc. Our 45m long bridge directly into the Limfjord in the summer is a big pulling pad, and many crabs are raised here. It is also possible fishing. Various types of board games, pool and table tennis are played indoor. Frydenstrand Camping 20 km east of Aalborg is the place where you can enjoy your holiday / leisure in covenant with nature. The site is located at Limfjorden, with views to Aalborg and Hals. 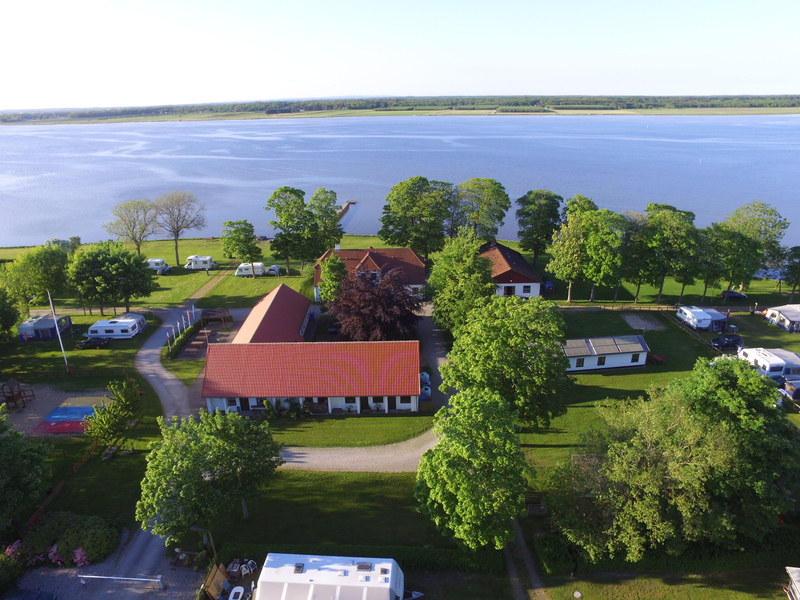 Frydenstrand Camping is one of the few places in Denmark with camping directly to the water, and we can always offer a room with shelter no matter what the wind blows. You can also stay in a cabin, cabin apartment if you do not prefer our lovely double rooms. From the benches and tables along the water you can experience the close traffic of sailing ships, cargo ships, tankers and luxury liners, passing the campsite on the way to or from Aalborg Harbor. In the fjord's speckled water you can experience the guinea pigs dance in the waves early in the morning and the sun downfall over the fjord with Aalborg in the background is an experience that is quite healthy to snuggle on. If you do not have a tent or caravan, we can offer you a stay in our 4-man cabins, comfortable apartments or in lovely double rooms. We offer both fixed space and 24-hour seats, for both caravans and motorhomes.